And, essentially, work together to do something about it. Treasurer Scott Morrison has accused Bill Shorten of "cheap rhetoric about an unfair Australia". CANBERRA -- It is hard out there. Really hard. According to the head of Australia's peak welfare body, the Australian Council of Social Service (ACOSS), it is coming down every day to a question to eat, or not. "People are worried about children who are not able to be fed well," Dr Cassandra Goldie told HuffPost Australia. "We've got a rise in child poverty in Australia. We have got very low incomes families who are going without meals in order to make sure their kids get food." There are 3 million Australians living below the poverty line, according to ACOSS and the University of NSW. Wages are not growing, there's been tripling of long-term unemployment, there's one job for every ten people are looking for paid work, and despite what was announced in the May Budget, the crisis of housing affordability remains. "In every capital city, if you are on the lowest incomes you virtually cannot afford anywhere which is in the private rental market," Goldie said. "These are common stories and there are people who are, if they are in employment, they are very worried about their inability to negotiate any increases in pay. And the risks (are there), that if they fall out of the labour market they may not even be able to get back in." Tackling inequality and poverty appears to be back on the political agenda. With scant detail, Labor Leader Bill Shorten has declared that "inequality kills hope" and that tackling rising inequality will be a "defining mission" of a future Labor government. We expect to hear more about that this weekend when Shorten unveils Labor's full tax policy on Sunday. Shorten denies he is just following a populist approach that almost worked for Jeremy Corbyn in the United Kingdom and Senator Bernie Sanders in the United States. But, it is clear Labor is being pushed to the left after the Turnbull Government was dragged towards what were derided as a series of "Labor lite" measures in the last budget. You know, that second best budget, Tony Abbott was talking about earlier this month. 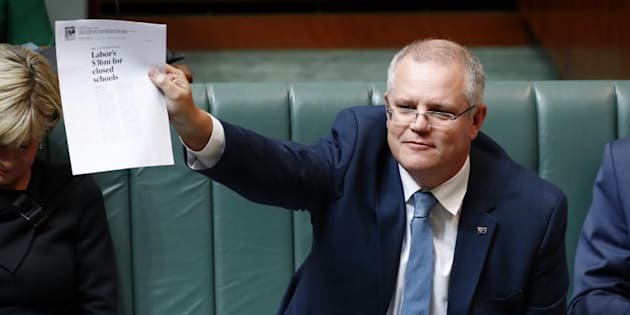 On Thursday, the man in charge of the Turnbull Government's purse strings, Treasurer Scott Morrison, accused Shorten of lying in order to bring in bigger taxes. It is to Morrison, "blatant ideology","cheap rhetoric about an unfair Australia" and "populism" from Labor and only the Turnbull Government has solutions. "We're not going to engage in this populist approach of Bill Shorten who is chasing votes like an ambulance chasing politicians when it comes to exploiting people's frustrations and fears," the Treasurer told the Adelaide audience. "We are replacing that frustration with hope. We are replacing the politics of envy with the economics of opportunity. But, Morrison had already been contradicted by a pretty serious independent source, the Reserve Bank Governor. Philip Lowe said, on Wednesday, that wealth inequality is on the rise. Asked by the ABC if he thought inequality was "rising or getting better in Australia", he responded, "well, it's risen." There was a distinction, for Lowe, between "wealth" and "income" inequality. "Wealth inequality has become more pronounced particularly in the last five or six years because there's been big gains in asset prices," the RBA Governor said. That forced Morrison to clarify on Thursday. "My comments have been in relation to income inequality and they've been particularly since the GFC (global financial crisis)," Morrison told reporters in Adelaide. "Now, the Reserve Bank Governor was talking about income inequality over a 30-year period. "I myself in my speech this morning acknowledged that when you look at things offer a 30-year period, then things have changed, but I also said they haven't grown in terms of inequality in Australia as quickly as they have in other parts of the world. "Bill Shorten is trying to sell you a pup so he can give you bigger taxes." Let's just pause for a second here. For ACOSS's Cassandra Goldie, these political arguments are not helping anyone. "It is disappointing to see," she told HuffPost Australia. "It can be convenient to argue over the technicalities of a definition." "I think this kind of political game is out of step with what the community wants to see. "I think overwhelmingly people in the Australian community want to see a fair and balanced society." For Australia's welfare groups, they've seen it all before and they insist things are getting worse. "There is no question that the disparity between higher earners and everyone else has been growing for decades. Yet this has been masked by overall economic growth," Goldie said. "The trend is for rising inequality, both in terms of income and in terms of wealth and this accords with the number of significant debates that are well and truly alive in the community." She wants social protections, like unemployment payments, protected and serious reform embarked on, including tacking industrial relations arrangements over wages growth. Most of all, she wants a meeting of minds. "What I think the community wants to see is the major parties coming to together to say we acknowledge this is a problem," Goldie suggested. A big ask in the current climate.